As Bryan Adams brought hordes of Coors Light-gripping Canucks to the main stage to close off night one of Ottawa's sprawling ten-day Bluesfest, the strange bedfellows of Nick Lowe and Los Straitjackets attracted a smaller, more urbane collection of aged festivalgoers over to the west end pavilion. 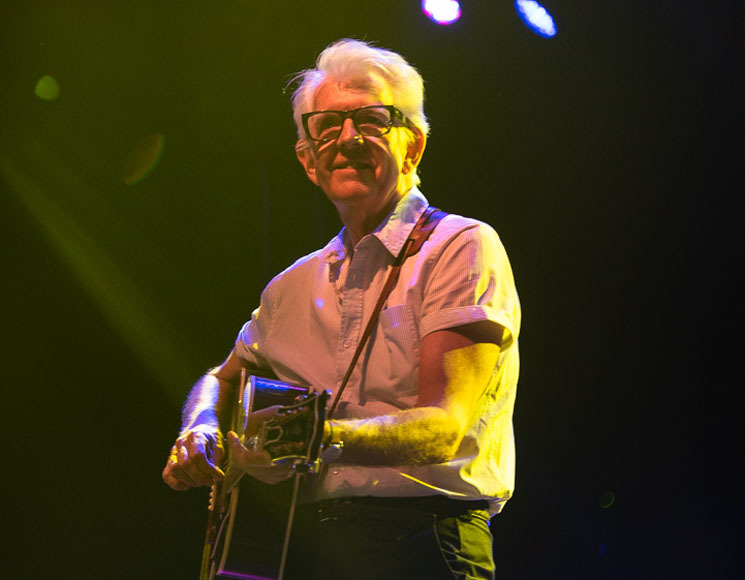 A pairing that stretches back to the dawn of the millennium, the godfather of British pub rock and the kings of Nashville surf rock brought their collaborative live show to the nation's capital for Nick Lowe's first appearance in the city in 34 years. Taking the stage wearing their iconic lucha libre masks while decked out in black, Los Straitjackets stood in stark contrast to the snow-white mane and business casual dress of the 69-year-old Lowe, who looked healthy and energized while greeting the crowd. Kicking off with his debut 1976 single "So It Goes," Lowe held the rhythm of the routinely punchy song back, as his backing band delivered a smooth backbeat for Nick to simply croon over. Moving into sluggish renditions of his lesser known early '80s singles, "Ragin' Eyes" and a cover of "Without Love" (a song he wrote for his wife's stepfather Johnny Cash), Lowe seemingly didn't find his footing until his fellow musicians gave "Shting-Shtang," an album track from his 1990 LP, Party of One, a needed dose of energy. After just 20 minutes of music, Lowe left the stage to allow Los Straitjackets to bust out a 25-minute solo set that left the crowd simultaneously frustrated and exhilarated, playing an extended version of "Itchy Chicken" that found guitarist Eddie Angel entertaining the audience with a hammy solo before moving into an ironic, but gorgeous cover of Celine Dion's "My Heart Will Go On." Returning to the stage for a brief 20 minutes, Lowe seemed to loosen slightly, rolling through fan favourites like "Cruel to be Kind," "(What's So Funny 'Bout) Peace, Love and Understanding" and set closer "I Knew the Bride (When She Used to Rock 'n' Roll)." As the festivalgoers demanded an encore, Lowe sent out Los Straitjackets to perform a rousing rendition of the 1966 "Batman Theme" before strolling out to give the crowd one last song, the 1978 Jesus of Cool album track, "Heart of the City." As Lowe politely thanked the audience before hustling offstage, it became clear that the promise of two such disparate musical entities appearing together on stage simply didn't live up to its appeal.